Sleeps 6, $15.00 per night per person over 6 people. This property is located on 2 and a half acres with one hundred & fifty feet of lake shore. 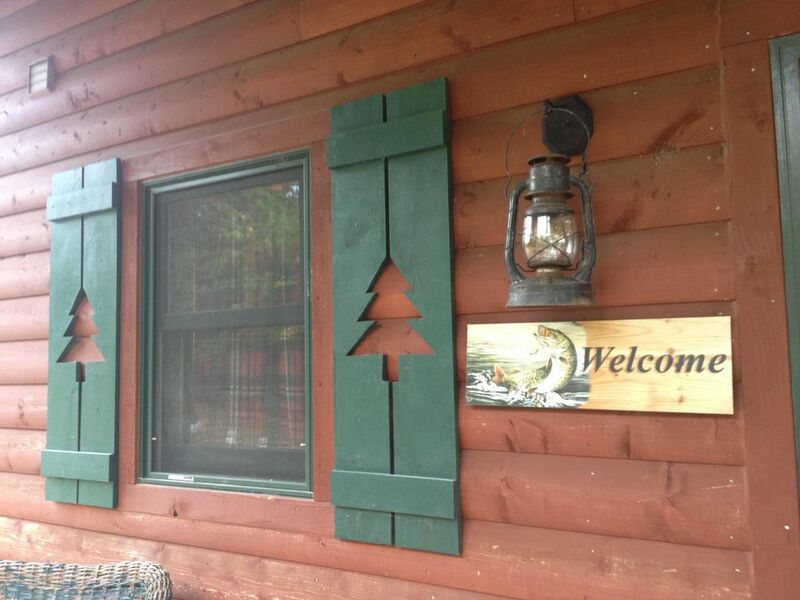 The cabin sits a mere 600 feet from the lake! The covered porch of the cabin is connected to a wrap-around deck over-looking the yard and lake. This is an open floor plan with the main bath room & master bedroom (queen sized bed) located on the first floor. There is a half bathroom located on the 2nd floor loft which contains another queen sized bed and two twin beds. The loft also has a sitting area over-looking the yard and lake shore. The kitchen has stainless steel appliances and granite covered island making it the perfect environment for cooking and entertaining! Your guests will enjoy sitting at the island eating, playing games or participating in the cooking while other guests lounge in the dining area or living room enjoying the view! Dan & Marnie Whitehead purchased this property in 1998 with the dream of clearing the property enough to put their airstream camper on it until they could build their own cabin. Together with their two young daughters, they accomplished their dream and built the cabin in 2003. They have been working on finishing the cabin by themselves for the past 10 years while enjoying raising their family. We fell in love with this property because of the many lakes, parks, festivals and other community events that bring people together! The property is absolutely serene no matter what season! East Leaf Lake not only offers a variety of activities on the lake but also on Leaf River which is also perfect for canoeing, kayaking & fishing. This is an excellent pan-fishing lake with good Walleye, Northern & Large Mouth Bass! The lake is perfect for families as there is low boat traffic on most days. The cabin is located on Curly Drive which is a dead-end country road bordering scenic farm land and groves of trees. East Leaf Lake is connected to West & Middle Leaf Lakes and the Leaf River. Enjoy the beautiful lake view from the lake shore line or from the large wrap-around deck over-looking the quiet property. sitting room also located in loft. Stove is an electric glass top stainless steel stove with a self cleaning oven. The pantry is stocked with a variety of necessities for cooking & baking. Kitchen is big enough for 2-3 people to prepare & cook a meal. Dining room table seats 6. Island seats 3 additional people. Enjoy some of the classics along with retro comic books & out door books. Wooden cabin doll house, wooden train set & other unique toys. Canoe with aluminum paddles. Life jackets of various sizes. Wrap around deck with covered porch includes two outdoor tables with seating for 6. My family and i stayed here for 4 nights to celebrate Christmas. We had a great time relaxing in this cabin. We cant wait to go back! Beautiful cabin, wonderful owners! My family and I stayed here and enjoyed everything about it! Super comfortable beds, and the perfect layout for spending quality time together! Beautiful place. Love lake view i would recommend this place only thing i didn't like here was water. Water smell when you shower it could be pipes. But i wont cut star for that. 5*. Gorgeous cabin getaway right on the lake. This is the perfect cabin getaway. Very private, well decorated, and plenty of space. Dan was a great host and very accommodating. I came up to the cabin for a guys weekend with my buddies and we had a great time. The cabin is well cared for and had everything we needed for the weekend trip. Thank you for letting use your lake home! We had such a great time relaxing in this cabin. We brought our dog along as well and she loved running around the yard! Definitely recommend! Family vacations are ideal in Otter Tail County with its convenient location and many lakes and state parks perfect for family activities. Otter Tail County is located in West Central Minnesota, just two and a half hours from Minneapolis and St. Paul and one and a half hour from Fargo, ND. Otter Tail County, is home to over 1,000 lakes and streams. That's 10 percent of Minnesota's 10,000 beautiful lakes! A PERFECT reason to go fishing, swimming, sailing, water-skiing or just relaxing on the beach. Otter Tail County is home of the famous Glendalough State Park, Maplewood State Park and Inspiration Peak. Each of these parks offers the best activities for your year-round outdoor recreational activities.